Main | Articles | What does solar energy expect in 2019? What does solar energy expect in 2019? According to the analysis of previous reports on the results of 2018, solar energy has demonstrated itself in the best way among all types of RES, lending its potential development to the current year. More detailed information is available just on the Ukrainian version of our site. According to Angus McCrone, Chief Editor of Bloomberg New Energy Finance (BNEF), on the prospects for renewable energy in 2019, there are all reasons to be positive: «…the transition to small hydrocarbon technologies this year will move steadily due to the merciless reduction of solar and wind power and lithium batteries, as well as expanding understanding of investors and corporations what does “sustainability” mean and based on their own interests simply do it. From the economic and political point of view, the current year may become quite turbulent, but all efforts that support “constancy” in all its manifestations, including energy, should benefit, and the term “sustainability” this year will become synonym of safe refuge, which will continue to provide profitable development. “Economic and political problems in 2019 may affect the investment flow in the” clear future, “but they will not stop it,” he added, noting that this year could become a year of significant innovations, first of all, solving solar / wind balancing problems VRE, reducing the cost of energy from RES to a level that will not require subsidization, and the widest “calcining” heat supplying. BNEF analysts expect 2019 to become the sixth consecutive year when global investment in RES exceeds $ 300 billion. 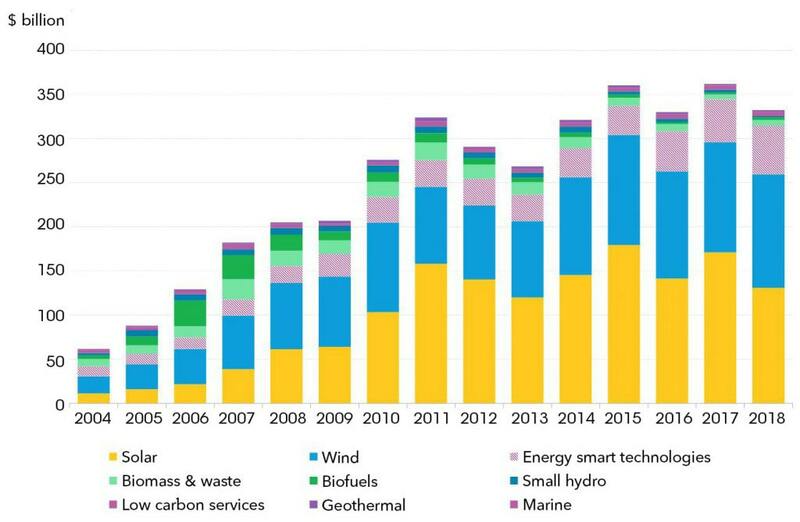 In January BNEF’s publication “Clean Energy Investment Exceeded $ 300 Billion Once Again in 2018” the data of the world’s investments in RES in 2004-2018 are given, taking into account the latest corrections as of January 2019. In particular, corrected statistics for 2017 (see table). These investments in RES, with the exception of large hydropower projects, also account for investments in intelligent power grids, “digital energy”, ESS and electric vehicles, including V2G technology. Data from the table, presented in the form of a diagram in Fig. 1, show that the nature of the world’s investment has periodic character, but in general has an aperiodic one, and it seems that it can conclude that the slowdown in the rate of development of RES is a false idea. Table 1. 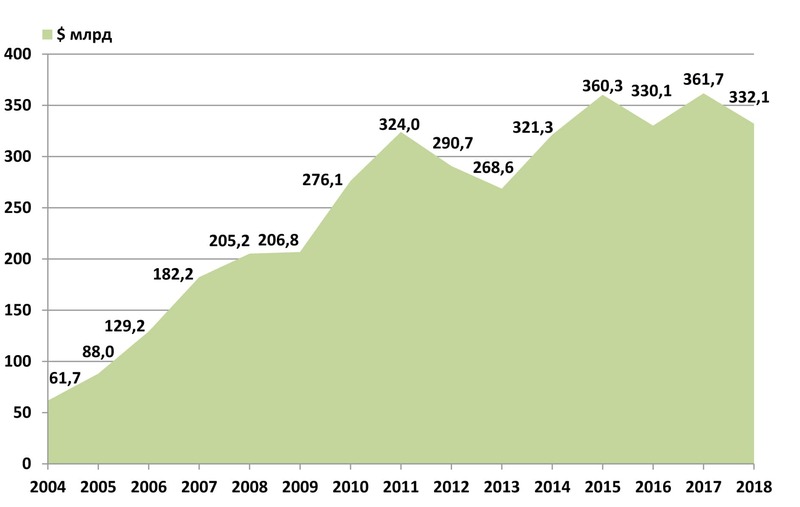 World investments in RES, 2004-2018, USD billion. Data adjusted as of January 2019. Source: BNEF. Global investment in RES in 2018 amounted to $ 332.1 billion, which is 8% less than in 2017, but the global net power of clean energy facilities, installed in 2018, has increased. Fig. 1. Dynamics of world investment in RES, USD billion, data for January 2019. Source: BNEF "Clean Energy Investment Exceeded $ 300 Billion Once Again in 2018". Financing of wind energy (by 3% to $ 128.6 billion) is increased; investment in biomass and waste energy increased by 18% to $ 6.3 billion; in biofuels – by 47% to $ 3 billion. Geothermal energy increased funding by 10% to $ 1.8 billion, small hydropower – by 50% to $ 1.7 billion, and the marine (litter and tributary) – by 16% to $ 180 million. What is more, investments in intelligent systems of accounting and redistribution of energy , in electric vehicles (including those capable of working under the scheme of V2G), and more have increased in absolute terms. The “investment paradox”, which does not reflect monetary statistics, is that the total volume of RES projects and small solar systems seems to have decreased by 13% and amounted $ 256.5 billion, but the added installed capacity in GW has increased! This paradox is most indicative of data on solar power as a whole. The total volume of investments in this sector decreased by 24% last year to $ 130.8 billion, see Fig. 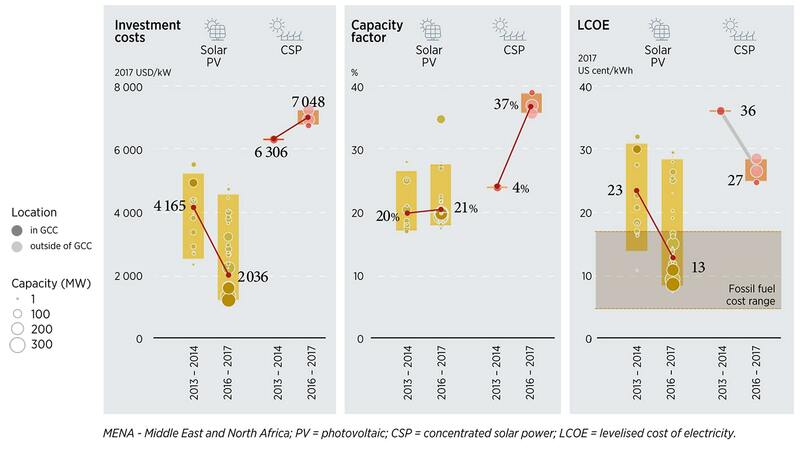 2, but at the expense of lowering capital costs (“global index” of BNEF, the cost of constructing new PV stations fell by 12% in 2018), more new PV capacities were built. Fig. 2. Global Global Investments in RES in terms of types, billion USD. Data for January 2019. 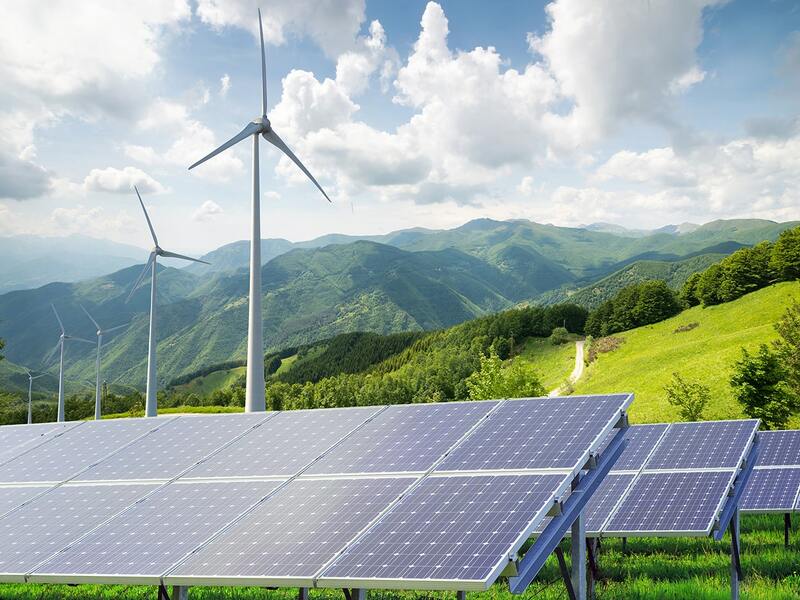 Source: BNEF "Clean Energy Investment Exceeded $ 300 Billion Once Again in 2018". Partly, it happened due to the sharp change in government policy in China regarding the cost of new projects to enter the RE market due to the insertion of so-called “Incoming fare”. These financial factors are directed on “cooling” the solar boom in China, and are motivated by the desire to reduce the impact of VRE projects on the functioning of the grid, to reduce subsidies, and sometimes to get rid of it at all, and give time to rebuild energy for its ability to compensate and absorb uneven generation from VRE. Another goal of the Chinese government is to force the energy industry to achieve “net parity” (which in China is primarily determined by the price parity with coal-fired power generation in each province). It will be accompanied by the so-called “Peak shift”, that is, measures of coercion, so that the thermal power plants reduce their power in favorable time for RES-generation, maximizing the output of electricity from solar and wind power stations. Under the influence of regulatory and fiscal factors, Chinese investments in the new solar power industry (the world’s largest solar module manufacturer) fell by 53% to $ 40.4 billion in 2018. Thus, there was an artificial overproduction of Chinese components of PV installations, and world prices for solar systems have also fallen, which has benefited investors in other regions of the planet. 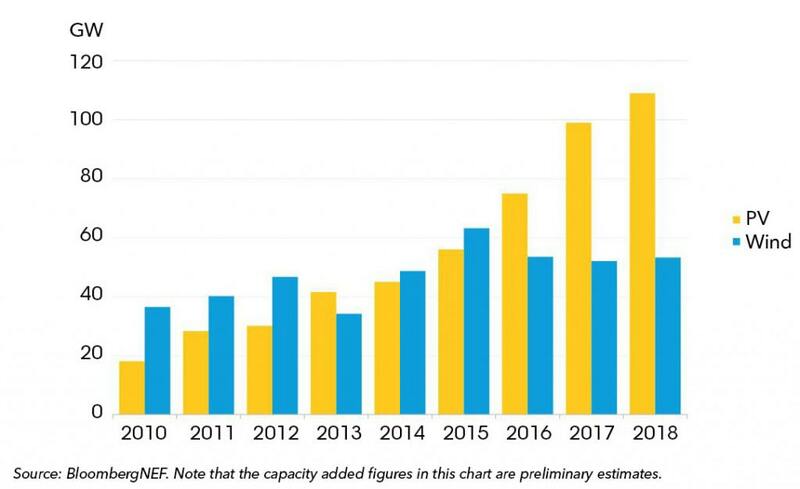 Head of the BNEF PV Energy Analysis Division, Jenny Chase, commented on this situation as follows: “We estimate that the total volume of PV installations in the world increased from 99 GW in 2017 to about 109 GW in 2018.” It is shown in Fig. 3. n 2019, global growth of PV-capacities in the range from 125 to 141 GW is projected. Despite the state restrictions in China, it is precisely this region that continues to be the leader of investment in new RES capacities – in 2018 they amounted to $ 100.1 billion. The paradoxes of investment did not pass away and the USA. Thanks to D. Tramp’s opposition to the introduction of clean energy in favor of traditional sources and its skepticism about global warming, American investors havetened to invest in green energy in order not to lose tax breaks, which will decrease with the beginning of the new decade. This led the United States to the second place in the world in terms of sovereign investments in REE – an increase of 12% ($ 64.2 billion). In general, Europe has invested 27% more in “clear” energy – $ 74.5 billion, most of all – in Germany (an increase of 32% to $ 10.5 billion). BNEF analysts compiled from a list of 22 countries whose investments in RES in 2018 exceeded $ 2 billion. This year, Ukraine was added to the overall index of growth of investments in RES (mostly PV-energy) by 15 times – by $ 2, 4 billion. Fig. 3. New added solar and wind power, 2004-2018, GW. Data for January 2019. Source: BNEF "Clean Energy Investment Exceeded $300 Billion Once Again in 2018". Global investments in public markets in specialized companies of clean energy increased by 20% to $ 10.5 billion last year. Global venture investments and equity investments of green companies jumped 127% to $ 9.2 billion, which has become the biggest point since 2010. In the US and Europe, together with investments in new RES capacities, there was also a boom with the simultaneous signing of electricity purchase contracts (PPAs) from them. Reducing the cost of RES, especially PV generation, everywhere leads to the use of “clean” energy on replace to traditional technology. Thanks to the PV generation, the transition to electrical energy, especially for local heat generation for residential, industrial and hot water heating, is becoming a global trend. This approach reduces energy costs compared to centralized heat supplying, and is becoming more and more profitable than the technology of burning hydrocarbons. Fig. 4. Electricity prices in the communal sector in the Persian Gulf region. Source: IRENA Renewable Energy Market Analysis: GCC 2019. The brightest illustrative example of this trend is IRENA data for those regions where hydrocarbon energy is on the lowest cost. For example, in fig. 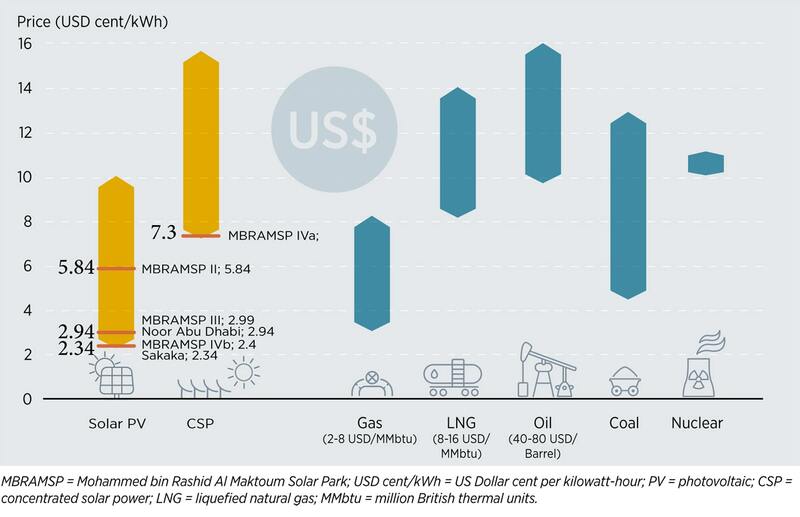 4 it is shown the prices for PV and CSP energy gained in the Gulf countries – that is, the cost of PV generation, even in places where cheap hydrocarbons are located, is currently lower. CSP projects should not be considered separately here as they are part of a system of energy accumulation in the form of heat, as, say like, the fourth phase of the Mohammed bin Rashid Al Maktoum Solar Park (MBRAMSP) solar park project in Dubai. Currently, the use of PV- and CSP-energy technologies is rather competitive compared to oil production, even if the price falls to $ 40 per barrel, Fig. 4. for example, MBRAMSP 2nd stage electricity price, which is 5.84 cents per kWh, is comparable to the price of electricity from oil at a price of $ 20 per barrel. In fig. 5 it is shown the economic performance of power generation in the Middle East and North Africa for 6 years. The calculated weighted average solar energy cost (LCOE) fell here by 43% and reached 13 US cents per 1 kWh for projects commissioned in 2016-2017, entering the price range of generation from relatively cheap fossil sources in the region – oil and gas. Fig. 5. Comparison of costs, power factor and weighted electricity costs in the Middle East and North Africa for PV and CSP technologies, 2013-2014 and 2016-2017. Source: IRENA Renewable Energy Market Analysis: GCC 2019. According to BNEF in 2019, bifacial modules (panels that can use lighting on both sides), technology for combining PV-generation with storage systems (ESS) and installations located on the surface of lakes, rivers and at sea will receive special development. The hybrid combined solar-wind stations will receive more funding. Good news for ESS makers – this market, including utilities and outsourcing, in 2019 will for the first time exceed 10 GWh compared to 8 GWh (or 4 GW of installed capacity) introduced in 2018. This will be facilitated by the recent decline in the cost of lithium and cobalt and the stiff competition in the market of batteries for electric vehicles. This situation with vehicle batteries will push down stationary system prices from a record low level achieved in 2018 ($ 176 per kWh), to an unexpectedly earlier level of $ 150 / kWh. An illustration of the further development of components that provide an increase of the part of RES in national energy and increase the flexibility of the grid can serve as a likely scenario for changes to the UK energy sector by 2040, as shown in Fig. 6. It is indicative, concidering that the country’s natural conditions do not contribute to the fullest use of PV energy, but it shows how this will compensate for the change in demand for overall energy sustainability. Further development will be the IoT (Internet of Things) regarding energy efficiency and smart energy flow management. Investments in this sector of IoT from the side of the industrial giants, ABB, Hitachi, Honeywell, Siemens, Rockwell Automation and Toshiba, are unreasonably expected. Therefore, the global digital sector of smart reallocation of energy flows at all levels – in household appliances, in small distributed networks, in the municipal sector and in local and regional systems – will receive further funding, along with improved dispatching, construction of RE objects along with demand areas (for example, PV stations on roofs of residential and industrial buildings, distributed wind systems, etc. ), technological equipment to increase the flexibility of conventional generation, modernization and construction of new distributions lchyh electricity grid system investments in ESS. The purpose of these measures is the further adaptation of existing energy systems to the requirements of increasing the share of RES in the total energy package.